Inside: Almost anything goes, asparagus, zuchuni, spinach, onions, tomatoes, sausage, different types of cheeses, pepper. In a separate bowl, whip 4 eggs and 1/3 milk. Using a glass, pie pan (well worth the investment of a few dollars at a grocery store), either create a crust by hand or defrost a store bought one and place it at the bottom of the pan. If you don’t have the crust or don’t want the crust, that is fine too. 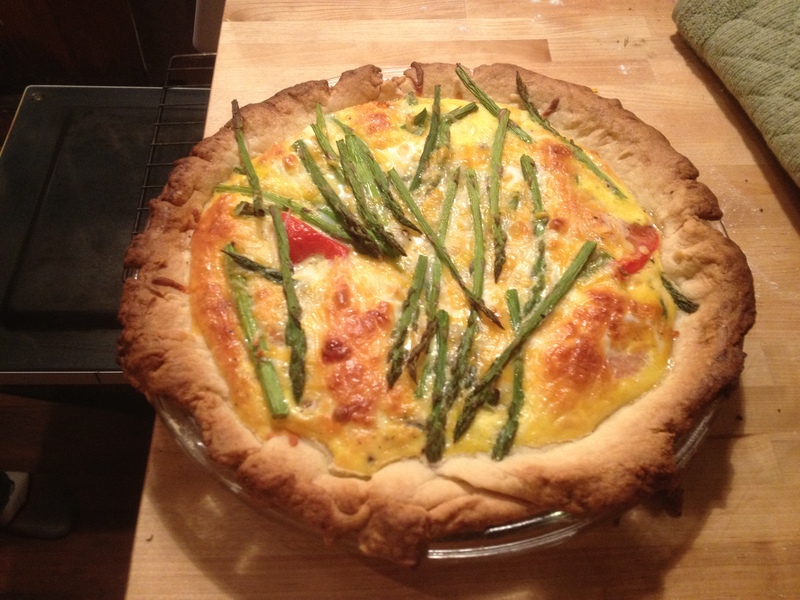 Place quiche fillings in crust. My favorite is asparagus, but whatever is in season, and add some shredded cheese (about 1 cup) to it, the more types of cheeses the better. No need to precook anything. Throw in some tomatoes, small bits of onion or other spices. Place in the oven for only 45 minutes.. check it after 40 minutes. It will cook a bit upon coming out of the oven. Crust and top should be golden brown. You can taste the difference between local eggs and store production eggs in color and flavor. This entry was posted in Uncategorized and tagged eggs, pie crust, quiche fillings, Quiche Recipe, types of cheeses. Bookmark the permalink.